Cyclists travelling along the Kallang River now have to contend with several obstacles, including an 83-step climb up with their bicycles to an overhead pedestrian bridge across the Pan-Island Expressway (PIE), and a 47-step descent on the other side. In the future, however, they could enjoy an uninterrupted journey from Ang Mo Kio to Gardens by the Bay, along Singapore's longest river. As part of the Government's plans to rejuvenate the Kallang River, the Urban Redevelopment Authority (URA) is asking for feedback on improving connectivity at seven areas. 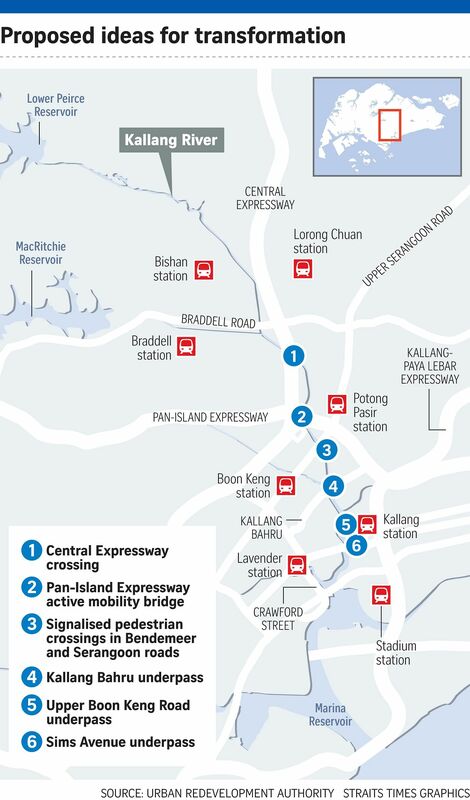 At these locations, major roads - the PIE, Central Expressway (CTE), Serangoon Road, Bendemeer Road, Kallang Bahru, Boon Keng Road and Sims Avenue - limit accessibility for pedestrians and cyclists. URA executive architect Sean Tan said that providing seamless connections along the river would allow for a "long and continuous park experience". "It creates an attractive environment for people, where they can escape the hustle and bustle of the city, and it can also connect communities," he added. To fulfil this vision, the URA is planning, for instance, to build a spiralling bridge across the PIE near St Andrew's Junior College as an alternative to the existing 14m-high pedestrian bridge. The new bridge would be a "great improvement", said Mr Woon Taiwoon, 42, co-founder of cycling group Love Cycling SG. "I know people in Bishan who want to cycle to their workplaces in the Central Business District but are deterred by the overhead bridge climb. This would make it easier for them," he said. The URA also hopes to upgrade underpasses as well as build new ones, including one under Sims Avenue that would help connect the Kallang MRT station to the Singapore Sports Hub. However, at Serangoon Road and Bendemeer Road, new at-grade pedestrian crossings - which are expected to be wider to facilitate cyclists - will be built instead to avoid having to divert gas and water pipes. Mr Woon said that in addition to the proposed additions by the URA, overhead bridges along the route could be outfitted with lifts for the elderly. Electric skateboarder Patrick Poh suggested widening pathways along the river to make access easier for cyclists, pedestrians and personal mobility device users. "A number of paths there are not that wide," said the 39-year-old real estate agent, who is a member of e-skateboard group Arc Boarders. Mr Tan said that the URA was encouraged by the feedback it had received so far. Members of the public have asked for improved lighting and more rest stops. The URA's plans may be viewed at the URA Centre in Maxwell Road until May 2. Visitors can give feedback at the exhibition, or online at ura.sg/kallangriver.